Scale models as an award make it very special! 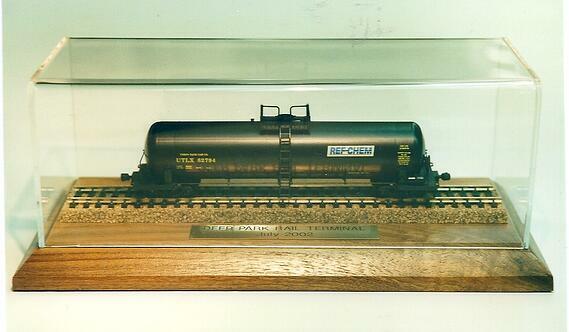 Model builders are sometimes requested to make a custom model or award for a special presentation. Here are three unique award examples and some things to think about. The 5" X 7" award pictured below holds a 2" diameter artistic glass globe with all seven continents that the recipient can spin with his or her thumb(s). This interaction engages the recipient and others who see it. The model builder both created the design and did the fabrication. The two clear acrylic panels slide together below the ball and are bonded together. If the award happens to fall these two clear panels help protect the expensive glass globe from breaking. The name of the person being recognized and the organization giving the award is engraved on it. 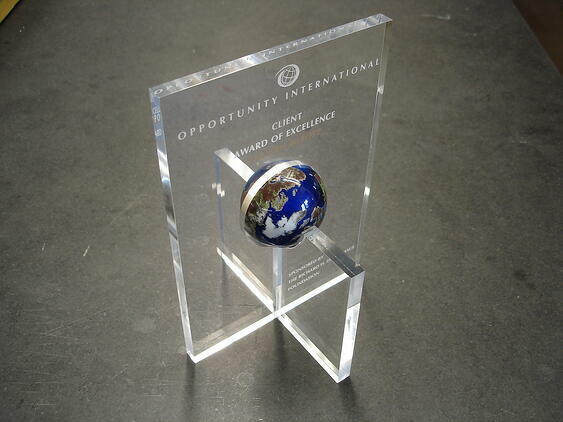 Prior to this design the plan was to just put each globe in a nice wood box to protect it and add a engraved brass plate with the award information to the top of the box. Shown in the picture below is a 18" diameter logo made from Legos which was ingeniously used to symbolize how a company was built brick by brick under the guidance of its founder. The original concept was going to be about 12" high. However with guidance from the model builder the client soon realized that the logo in Legos had to be about 50% bigger in order to more closely resemble the company's logo. This Lego logo wraps around all sides of 5/8" thick clear acrylic sheet which was cut into the shape of a round head with a neck. A five sided clear acrylic dust cover (not shown) was included. Model kits when made with fine craftsmanship and quality materials are very meaningful to the recipient in industries such as transportation when that person's work is related to a product such as a railroad tank car. The model can be customized to have the same markings and details that relate most to that person. With model kits the details are very important and get noticed. Is the lettering crisp or is it fuzzy? Is the lettering straight or crooked? Round tank cars are not easy to paint. Does the paint finish look the same on the whole model? Does the dust cover fit snugly or is it loose? Are the right couplers used on the railcar? Are the screws that attach the model to the wood base hidden behind the wheels or are they visible under the middle of the railcar? You should consider seeing in person an example of a similar model or at least close up pictures of it before placing an order. Model Builders, Inc. is known for creative thinking and fine craftsmanship. If you are looking for a custom model to award to a person or company take the next step by contacting us at Model Builders, Inc., 773-586-6500 or info@modelbuilders.net .